Directly across the Pika Glacier from the Royal Tower lies the hulking mass of The Throne (7,390 feet). This appealing peak quite possibly has the best rock in the area. It offers a variety of routes from the vertical west wall, to the more broken south face, to lesser known routes on its north and east faces. From the summit, the views of Foraker, Denali, and Hunter are nothing short of spectacular. The peak consists of two bulky masses separated by a deep cleft up its south face. To the left of this cleft a rounded but distinct ridge provides a fun and safe route up to the main east-west trending ridge crest. If snow conditions (or lack thereof) allow, this interesting knife-edge ridge makes a magnificent finish to the top summit block. 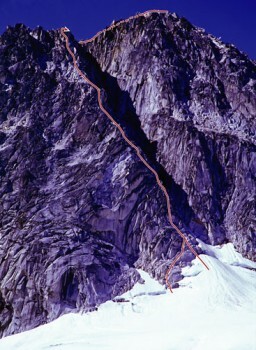 This route, The Lost Marsupial, is one of many great routes that climbers enjoy on The Throne’s south face. Which SuperTopo guidebooks include a topo for Lost Marsupial?